What do you mean I am paying for space I don’t occupy? That’s right, you’re paying for space you don’t have complete control of. You may have seen the terms “load factor,” “rentable” and/or “useable” square footage in your lease, understanding the difference between usable square feet and rentable square feet can mean all the difference in evaluating multiple transactions. An unfortunate, but fairly common mistake many tenants make is not understanding these terms and the calculations behind them. Useable Square Feet – The space within the walls of your office suite, what I like to call carpetable square feet. It is the space you occupy and transact business out of. The common areas of a typical office building include but are not limited to: main floor lobby, elevator lobbies, corridors, restroom facilities and other such “common areas”. For example, if a building was 120,000 rentable square feet and it had 20,000 square feet of common areas. This would leave a total of 100,000 useable square feet. 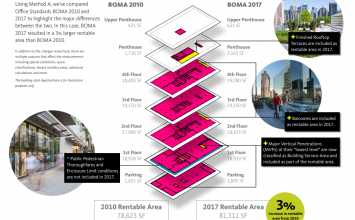 You occupy 10,000 useable square feet, or 10% of the building. So, in order to calculate your rentable square footage, you add 10% of the common areas (20,000 square feet) to your useable square footage (10,000 square feet) for 12,000 rentable square feet. The load factor is the rentable square feet divided by the useable square feet (RSF/USF). In our example, it is 12,000/10,000 = 1.20%, or 20%. How do Landlord’s quote rates you ask? They quote rates on a rentable square foot basis, so the tenant pays its share for the common spaces in the building. This methodology is very common and generally accepted, however, tenants should pay close attention to these calculations as the measurement methodology is always changing. Load factors for multi-tenant office buildings can range from 8% to 25% depending on size and design. When the load factors are high, oftentimes landlords will not bother to calculate it and merely state it at a market average in an attempt to be more competitive. These calculations can be subjective, and provide opportunity for a landlord to interpret, manipulate and calculate to their advantage and your detriment. Today the Building Owners’ and Managers’ Association (“BOMA”) guideline is the closest thing to an industry standard, although it’s often subject to wide interpretation and is not universally accepted. Tenants should choose an experienced, exclusive tenant representative to help navigate them through pitfalls such as these.